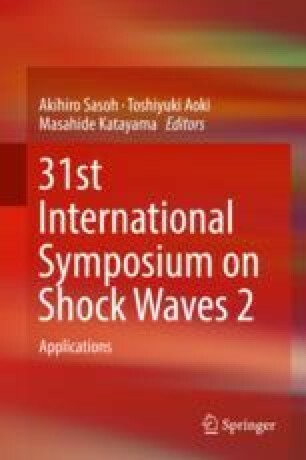 A semi-conservative, stable, interphase-capturing numerical scheme for shock propagation in heterogeneous systems is applied to the problem of shock propagation in liquid-gas systems. The scheme is based on the volume fraction formulation of the equations of motion for liquid and gas phases with separate equations of state. The semi-conservative formulation of the governing equations ensures the absence of spurious pressure oscillations at the material interphases between the constituents. Interaction of a planar shock in water with a single spherical bubble as well as twin adjacent bubbles and a bubble array is investigated. Several features of the interaction process are studied, including propagation and focusing of the transmitted (refracted) shock within the deformed bubble, creation of a water hammer by a diffracted shock in water, and generation of high-speed liquid jet due to induced flow vorticity in the later stages of the process. The financial support of Vetenskapsrådet (VR) (the Swedish Research Council) is gratefully acknowledged.